Do you love the adventure and mystery of rail travel? Do you love Wine? Cruise to Portland in 1st class Pullman style, enjoy the City of Roses for three full days (plus two partial days) and return home rested and relaxed! 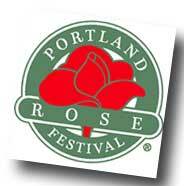 Our stay in Portland even coincides with the world famous Rose Festival and Fleet Week! 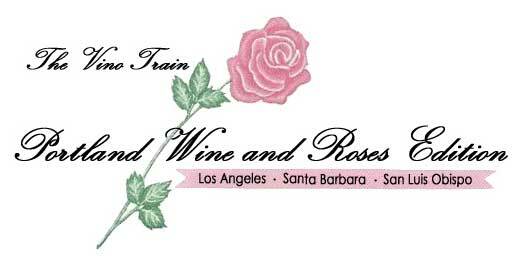 Introducing the "Vino Train, Portland Wine and Roses Edition". First class train travel reminiscent of the trains from the 40s and 50s! Our vintage rail cars become your home away from home while we enjoy a wine theme rail escape to Portland, OR. 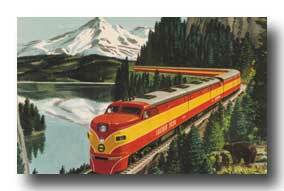 Enjoy your private sleeping accommodations and the stunning Streamline Moderne ambiance of the Overland Trail. There will be wine tasting enroute provided by local wineries and, of course, don't forget, scenery that "won't quit". Do you love adventure? Do you love the mystique and romance long associated with exotic train travel? Then please, peruse these features. 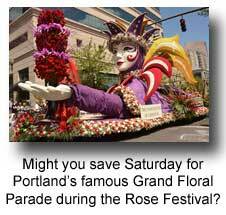 Do as you please on your free days in Portland ... might that include a Portland Rose Festival Parade? The Overland Trail, your exclusive lounge car, is known for its stunning, luxurious, yet so inviting "living room" feel. Here is the place to move around and make new friends as you visit with your like minded travelers. Enjoy a game of canasta at one of the six card tables. Read your favorite book or the latest periodicals in a most joyous atmosphere ... the comfortable and colorful surroundings of the Overland's lounge has ambiance that just won't quit! 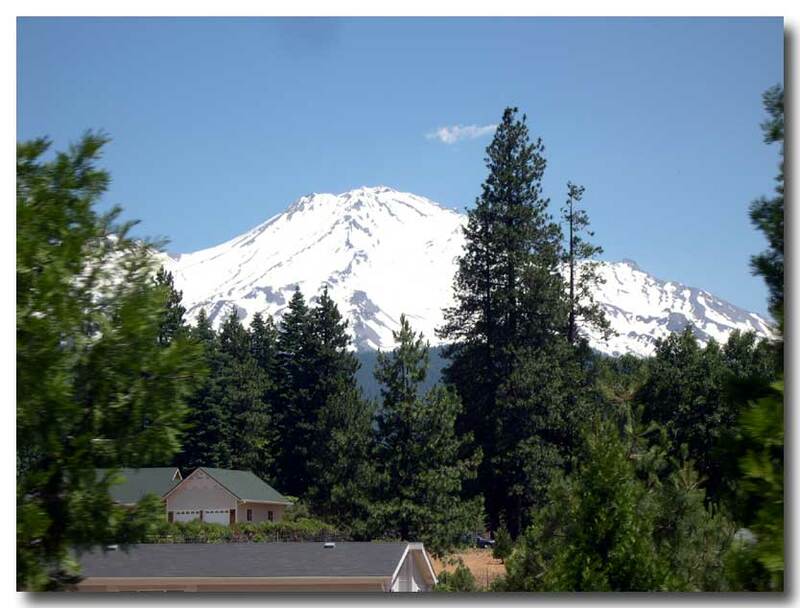 And of course, WHY do we love rail travel in the first place ... you'll enjoy ever changing vista's out the large picture windows as we transverse the spectacular route of the "Coast Starlight" (the train that pulls our special cars)! Our private cars are from the 40s & 50s, the Overland Trail from the Southern Pacific, the Pacific Sands from the Union Pacific. They have been carefully restored and upgraded to meet current Amtrak requirements and can be entrained on virtually any Amtrak train for exciting destinations around the country. 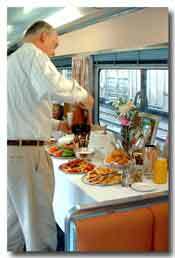 Private one person room called a Roomette: $1995.00 pp single occupancy. Private two person room called a Double Bedroom: $1995.00 per person based on double occupancy. Our Pullman will also be our "hotel room" in Portland ... no extra expense there! 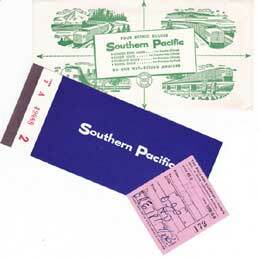 Our Routing: Our train transverses the spectacular "Coast line" and "Shasta Route" of the former Southern Pacific Railroad (now Union Pacific). Our special cars will be coupled to the regularly scheduled Amtrak train #14 northbound and train #11 southbound. 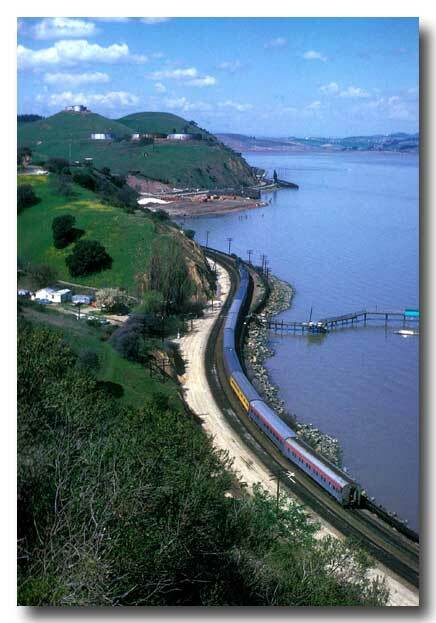 We'll enjoy many scenic highlights through the large picture windows of the Overland Trail including the; Santa Susana pass, 113 seaside miles along the mighty Pacific Ocean, Horseshoe Curve above San Luis Obispo, Mt. Shasta, Cascade Mountains, Odell Lake, Willamette River and much more. Click here for a photo album from past trips. Portland ... a rail travelers paradise. The oldest big city depot west of the Mississippi, this glorious station is a wonderful "museum" in its own right. The station is located along the Willamette river in downtown. Portland's modern day streetcars stop next to the station for easy excursions from your "front door" (because our Pullmans are parked right at the depot). The shopping/dining "Pearl District" is even walking distance. You won't lack for things to do ... wonderful museums and other attractions abound ... and our stay coincides with the Portland Rose Festival and the Navy's Fleet Week! Aside from our organized excursion, patrons are "on their own" during our layover in Portland, we will not pretend to know all the hot spots or direct your paths. The Internet might be a great place to start planning where YOU will go while enjoying your free time. 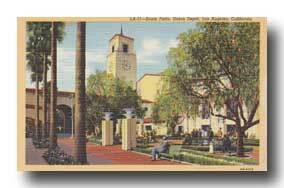 Our departure from Los Angeles Union Station will be at 10:10 am on Wenesday, June 8, We'll enjoy a mimosa toast at our Bon Voyage party and wave "good by" to LA. Traveling north, we'll reach the Pacific Ocean around Ventura and enjoy lunch as we pull into Santa Barbara. Then we'll glide through Vandenburg Air Force Base and view launch pads and dramatic coastline. We'll enjoy dinner near Salinas, then, perhaps, an evening libation in the lounge before retirement to your Pullman accommodation. If you wake up early, you'll enjoy the spectacular trip around Mt. Shasta. Our scheduled arrival in Portland is 3:32pm, Thursday, June 9 ... just in time for making diner plans -- maybe the vibrant nightlife in the Pearl District of Portland? Our departure from Portland Union Station will be at 2:25 pm on Monday, June 13, We'll again enjoy the terrific Willamette River scenery as we travel away from Portland ... so lush and green! 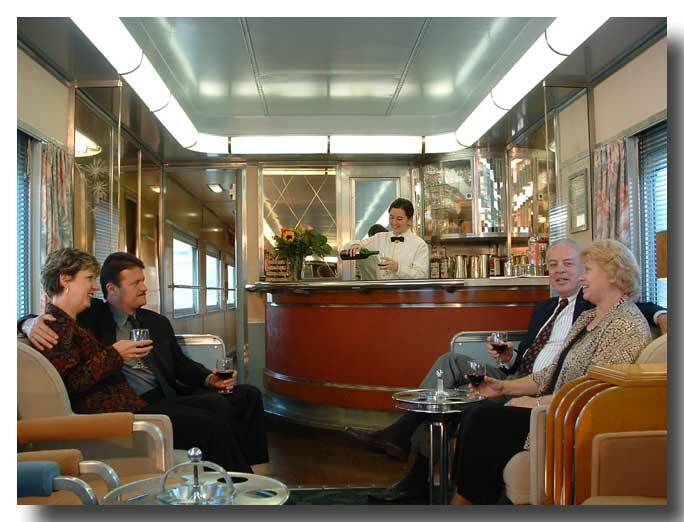 "Dinner in the diner" and a nightcap aboard the Overland ... then la-la-land in your Pullman accommodation. If you arise early, you'll see Sacramento and soon after, lots of water as we skirt Suisun Bay, San Pablo Bay and even catch a glimpse of the Golden Gate just before we arrive Oakland. With breakfast past, there will be miles of farmland and lunch near Salinas. Dinner in the diner around Santa Barbara and our final arrival back in LA scheduled for 9:00pm. What a grand trip we've enjoyed! Only 20 Pullman spaces available per trip ... we offer an intimate journey where friends are made and personal attention is the order of the day. We expect brisk sales for this wonderful journey ... don't be disappointed ... call now to make your reservation! Only ten percent will hold your reservation until 30 days out from sailing. please call 714 546 6923 for help. You may board at any intermediate station such as Van Nuys, Oxnard, Santa Barbara, etc. 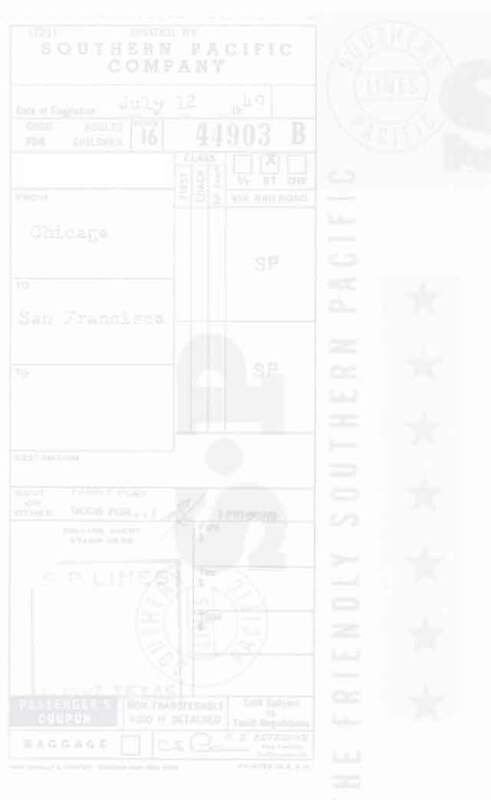 (sorry, there is no adjustment to the fare possible).